November 5, 2010 -- Morning Star -- Relations between the Congress of South African Trade Unions (COSATU) and sections of the ruling African National Congress (ANC) plumbed new depths this week following a union-initiated Civil Society conference. So far so uncontroversial, but the organisers had agreed to make the conference non-party political, which meant that neither the ANC nor the South African Communist Party (SACP) were invited to take part. 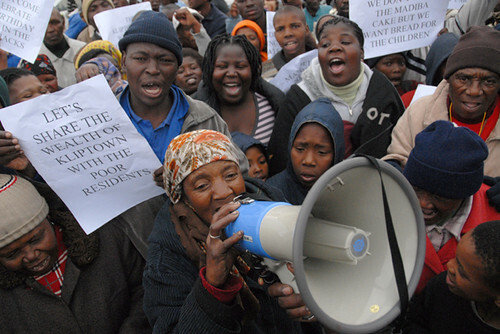 While South Africa's pollies and "BEE" elite party, there is little for poor to celebrate. September 28, 2010 -- Last week’s meeting of global leaders at the United Nations was predictable: more posturing about unmet global needs in relation to the eight Millennium Development Goals (MDGs) set a decade ago. South Africa’s President Jacob Zuma was too busy to attend, staying in Durban to restore order at a major African National Congress (ANC) leadership conference. Since coming to power after a palace coup against Thabo Mbeki exactly two years ago, the new government’s performance has been miserable. For example, roughly 1.5 million jobs have been lost, in spite of a major economic burst before and during the mid-2010 World Cup.